Istanbul is a spectacular city, filled with layer upon layer of history, culture, and incredible food. In this Istanbul travel guide for food lovers you’ll discover useful information for your visit, including where to stay, what attractions to visit, and most importantly, some of the most delicious Turkish food you don’t want to miss. Ok, let’s begin with this Istanbul travel guide! Note: You can see all my city food guides here. Get ready for some amazing Turkish food! Istanbul is a city I’ve personally wanted to visit ever since learning about Constantinople in Western Civilization class back in 9th grade. 16 years later, I finally had an opportunity to visit for the first time. It truly is an amazing city, full of vibrant life, incredibly generous and hospitable people, mind-blowing history and rich culture, and a mix of Turkish food that will have your taste rejoicing and craving more. On my 4th day of this trip to Istanbul, my wife and I woke up in our hotel room as the entire hotel was shaking like an earth quake. I pulled up the news on my phone and all I remember is seeing the Turkish flag on the front page of CNN, and in my half sleep. It was 16 July 2016, and there was an attempted coup in Turkey, which later turned out to be a failed coup. My wife and I were grateful to be safe, to have an amazing place to stay during our time in Istanbul, and to have the support of so many amazing Turkish people. Although we were in Istanbul during the attempted coup, that does not change my opinion about how incredible Istanbul is. And the day after the coup, my wife and I headed out and had one of the most memorable days of eating and meeting restaurant owners of the entire trip (did I mention yet that Turkish people are some of the most hospitable and generous people in the world?). I wrote this Istanbul travel guide to give you tips about where to stay, things to do, and some of the most incredible food I tried during my trip to Istanbul. Despite the circumstances that occurred during my visit, Istanbul remains one of the greatest cities in the world. 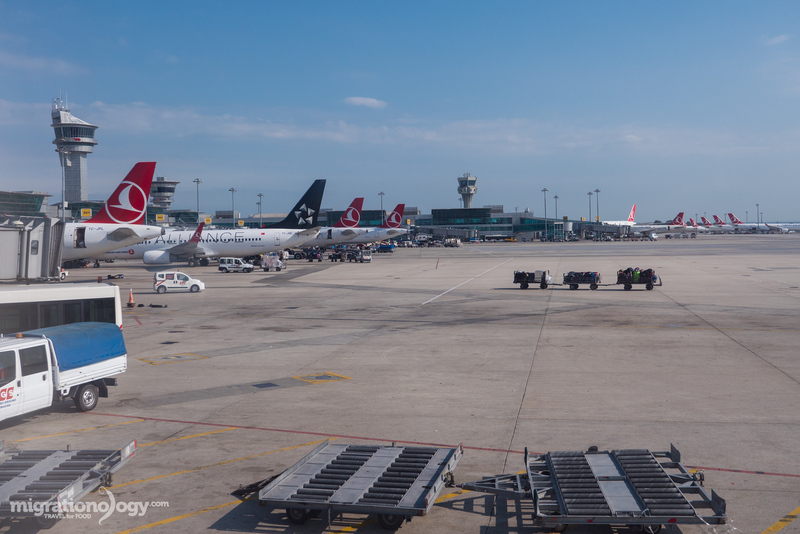 If you’re flying into Istanbul, you’ll likely land at Istanbul Atatürk Airport, a big and modern airport with tight security. The airport is located about 24 km west of the center of Istanbul. With traffic it can take up to 1 hour to get to the center of Istanbul, but without traffic it just takes around 30 minutes by road. On a side note, if you’re flying on Turkish Airlines and can get access to the Turkish Airlines lounge at the airport, it’s pretty awesome – there’s some amazing food there! Ok, so after proceeding through immigration and getting your luggage, you can walk outside Istanbul Atatürk Airport and choose your method of transportation to get to where you need to go. Those of you who are from Europe can enter Turkey without a visa, but for the majority of other people, you’ll need a visa to enter Turkey. However, there are also some random exceptions, like my wife who is from Thailand, and she doesn’t need a visa to visit Turkey. So make sure you do your own research for the requirements you need to travel to Turkey. 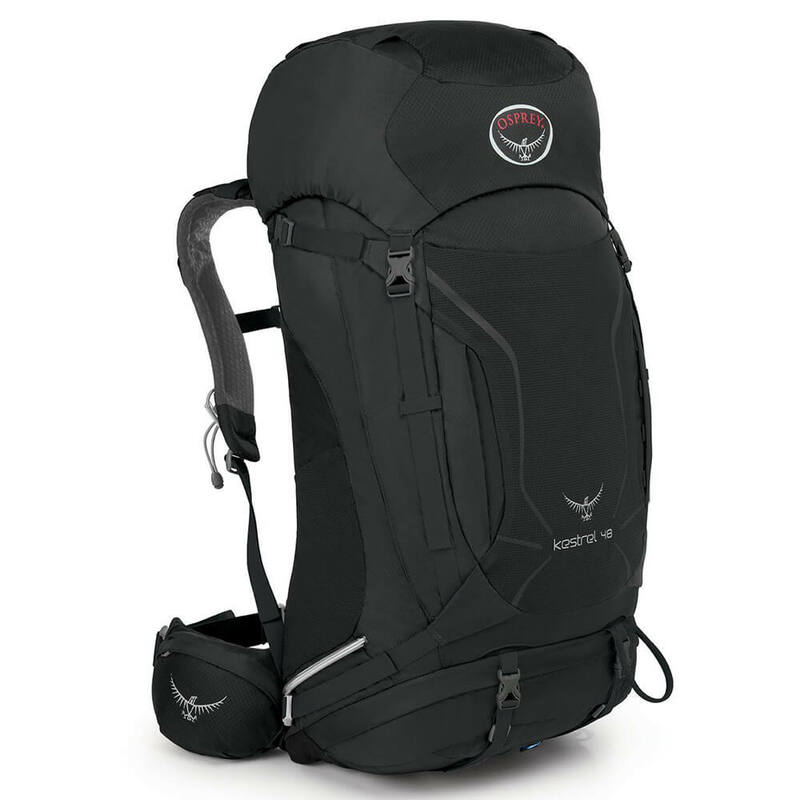 For those of us who need a Turkey visa (I carry a USA passport), the good news is, you can apply for a Turkey visa online before you arrive, and it’s hassle free and easy to do. You can check to see if you quality for an online visa here. To apply for an e-visa, first go to the official Turkey e-visa website. Make sure your passport has over 6 months validity, fill out your information on the application, pay the fee of $20 (but can depend on what type of tourist visa you want), and you can almost instantaneously download your Turkey visa. Print it off, and have it ready when you land in Istanbul. I had no problems with my Turkey visa, and I passed through immigration quickly upon landing. 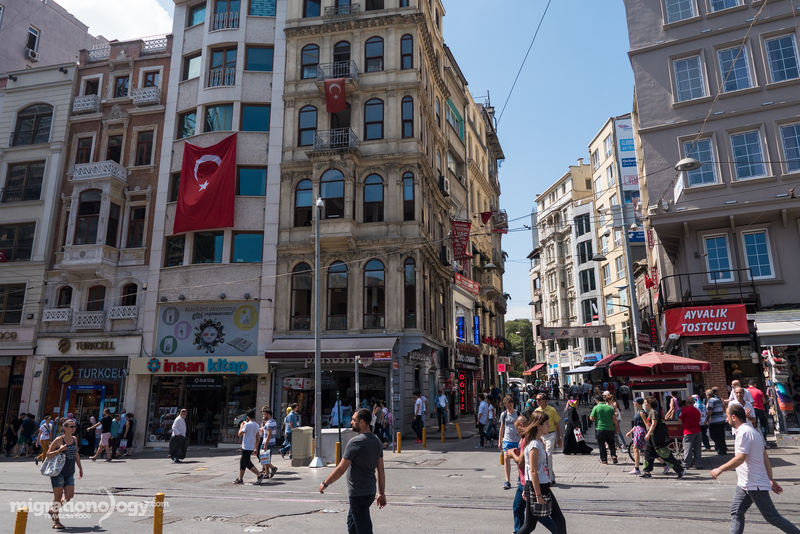 My wife and I arrived to Istanbul at about 5:30 am in the morning, and since we were not in a rush, I thought it would be a great idea to take the bus to Taksim Square, which was a short walk from the hotel we stayed at. All you have to do is walk outside the arrivals terminal, and a little to the right hand side and across the first series of lanes, you’ll see some bus stops. I took the Havabus (or Havataş), and it cost 11 TL ($3.73) per person. No need to buy your ticket ahead of time, just get on the bus, and pay on the bus. The bus route goes from Istanbul Atatürk Airport to Taksim Sqaure, and the final stop is right by Point Hotel Taksim. When we were leaving Istanbul, since we didn’t have much time, we decided to catch a private taxi from the hotel to the airport. Taking an Istanbul taxi is pretty straight forward, and taxis should always use the meter. From Taksim Square to Istanbul Atatürk Airport, the taxi ride cost exactly 57 TL, which I thought was pretty reasonable. I think depending on route and traffic though, it will cost you anywhere from 60 – 80 TL for the ride. You should choose your method of transportation depending on what time you arrive / leave Istanbul, and also about which area of the city you’re staying in or need to get to. Where to Stay in Istanbul? Just like Bangkok, Istanbul is a city that offers just about every type and form of accommodation imaginable, in an overwhelming quantity. Many of the major world hotel brands are present in Istanbul, but there are also many family run guest house style accommodation options as well. Like I mention in all my travel guides, location and expectation is highly important when you travel and look for accommodation, which is why I like to give you some good areas of Istanbul to stay in and what they have to offer. Sulthanamet is a neighborhood in the Fatih district of Istanbul, it’s a very old part of Istanbul, and it’s home to some of Istanbul’s most famous attractions like the Blue Mosque and Hagia Sophia. Though it’s a major tourist area, it’s an amazing place to stay because you’re surrounding by incredible points of history, and plenty of restaurants and shopping options. There are lots of good budget places to stay in Sulthanamet like Hotel Arcadia Blue or the homely Marmara Guesthouse. One of the most central and key points of modern Istanbul is Taksim Square (and in this area I’ve also included İstiklal and Beyoğlu). It’s right in the heart of the city, with shopping and restaurants in the area galore. This is a fantastic central area of Istanbul, where you can really soak in all the sights and sounds of Istanbul. You’ll find high end hotels like the The Ritz-Carlton and InterContinental, as well as mid ranged hotels. One of the areas I fell in love with when my wife and I were trekking around Istanbul to create this Istanbul travel guide and videos is Beşiktaş. It’s an area that’s not far from Taksim Square, but it has more of a local neighborhood feel, and some incredibly good Turkish food. There are some high end luxury hotels in Beşiktaş like the Four Seasons at the Bosphorus, but also some more budget friendly places like Sunrise Istanbul Hotel. There are many other areas of Istanbul as well, and plenty of fantastic areas if you want to be a little further out of the center of town. But these three areas are some central locations for convenient transportation and access to Istanbul attractions, shopping, and food. Where did I stay? My wife and I stayed at The Ritz-Carlton Istanbul, as a sponsored stay. 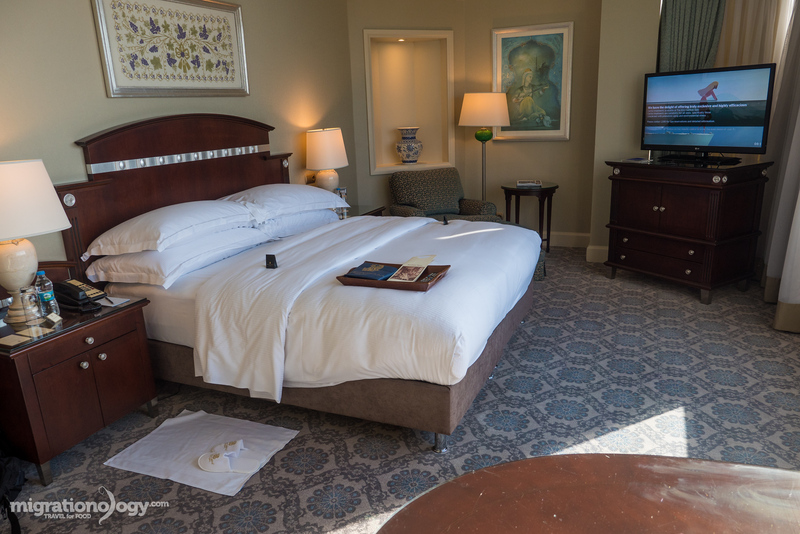 The hotel is in a fantastic location near Taksim Square, we had an amazing view of the Bosphorus from our room, and the service was excellent as you’d expect from the Ritz. If you’re looking for a luxury stay in Istanbul, The Rtiz-Carlton was fantastic. Note: Links to hotels are affiliate links, meaning that if you make a booking, at NO extra expense to you, I’ll receive a small commission. 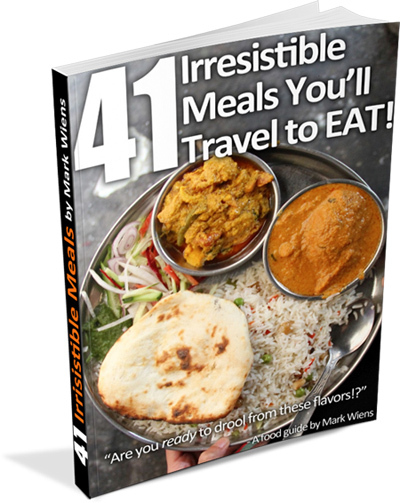 This will help me to continue to write free travel food guides like this. Thank you in advance for your support. Here are a few of the things I brought with me when I traveled to Istanbul (these are Amazon affiliate links). 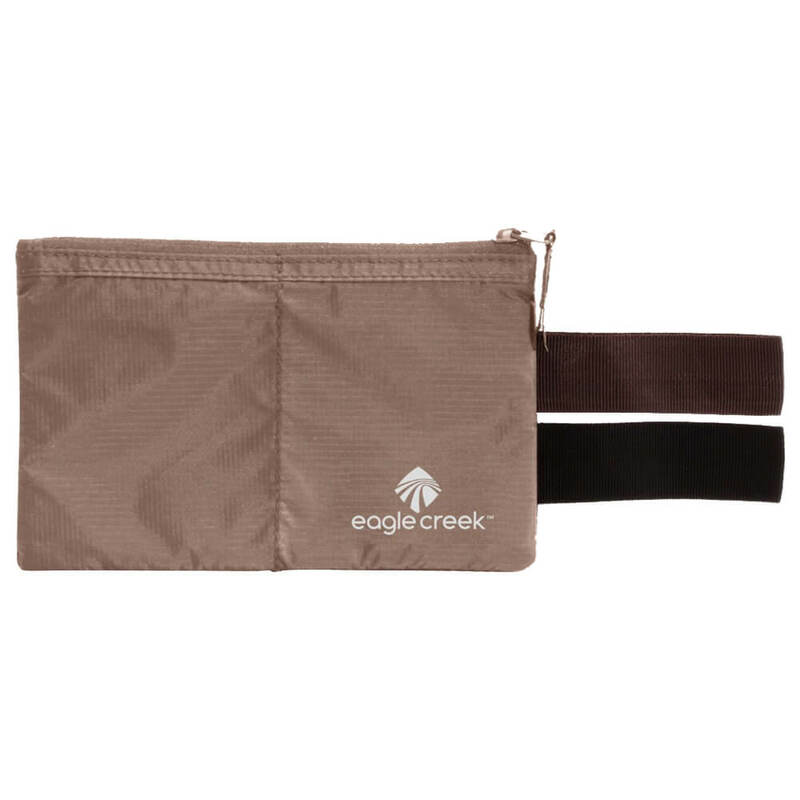 To see more of my travel gear, check out my resources page. Get ready for some incredibly delicious Turkish food! Now we’re ready to get into the really good stuff: food. Istanbul is one of the most ancient cities in the world, packed with history and a food culture that is deliciously exciting. I think (and I think you do too) the absolute best reason to visit Istanbul is for the food, and of course, this Istanbul travel guide is for food lovers. I found this publication by Ministry of Foreign Affairs of the Republic of Turkey about the story of Turkish food to be extremely interesting and insightful. History and empire – Istanbul has been one of the most important and influential cities in the history of the world, home to the Ottoman empire which flourished for hundreds of years. This history and rule, opened the doors for Royal palace cuisine to develop and progress. Natural ingredients – Turkey is naturally blessed with a huge variety of natural ingredients due to the vast diversity of climates and environments. Plants, spices, and seafood and animals, thrive in Turkey, and the abundance of natural resources helped to develop Turkish cuisine. Geographical location – Finally, due to geographical position, as a bridge between Asia and Europe, and links to the Middle East, Turkey has been a trade hub of the world for centuries. Ingredients and flavors from around the world have made their way into Turkish cuisine. These are just a few of the many factors that have helped in the development of Turkish food and some of the clues as to why so many dishes are so incredibly delicious as you will find as soon as you start eating in Istanbul! Soon, I’ll be publishing a full blog post about the best Turkish food to eat. Stay tuned for that. There are a near endless amount of restaurants that you can eat at when you’re in Istanbul. Here are some of the best restaurants in Istanbul that I had a chance to try during my trip. Unfortunately due to time and circumstance, I didn’t get to try all the Istanbul restaurants I had on my list, but this is a pretty good round-up. Lades Menemen Restaurant (breakfast) – Located just off Istiklal street, Lades is a Turkish breakfast restaurant that is well known for serving menemen, which is a Turkish egg dish. I ordered the Turkish sausage menmen and it was unbelievably delicious. Address: Katip Çelebi Mahallesi, İstiklal Caddesi, Sadri Alışık Sokak, No 11, Beyoğlu, İstanbul; Open hours: 6 am to 11 pm daily. Çakmak Kahvaltı Salonu (breakfast) – Thanks to FoodieHub for this Turkish breakfast recommendation located in Beşiktaş. Along with the full spread of cheese, olives, kaymak, and bread, I ordered the eggs with tender beef cooked in its own fat. It was crazy good, especially with bread and all the Turkish breakfast side dishes In this Istanbul travel guide, this was one of my favorite places for breakfast. Address: Sinanpaşa Mh., Çelebioğlu Sk. No:8, 34353 Beşiktaş/İstanbul, Turkey; Open hours: 7 am to 7 pm daily. 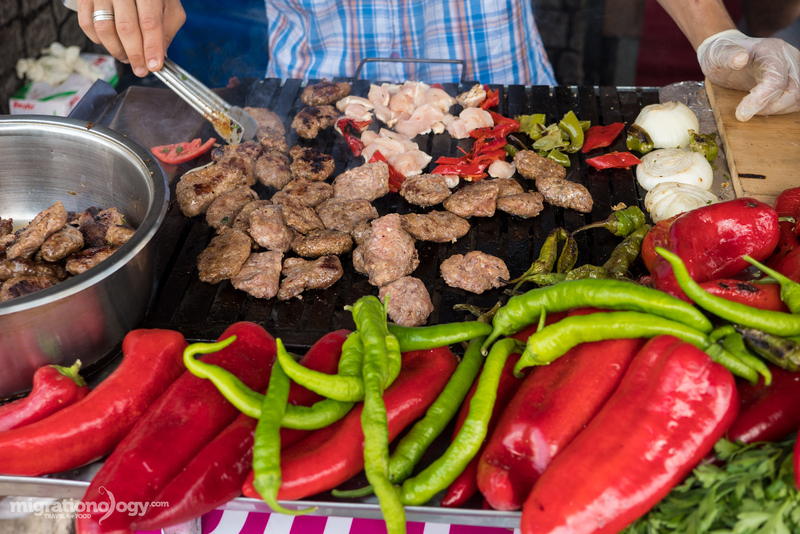 Şehzade Cağ Kebap (kebab) – Cağ Kebap is a type of kebab from Eastern Turkey that cooked on a horizontal spit (unlike the typical vertical spit), and if you love food, it’s something you don’t want to miss eating in Istanbul. Address: Ankara Cad. HocaPaşa Sok. No:4, 34110 İstanbul, Turkey; Open hours: 10 am to 9:30 pm on Monday to Saturday (closed on Sunday). Tarihi Karadeniz Döner (doner kebab) – Tuba from Istanbul Food says this is the best doner kebab in Istanbul, and after eating there, I have zero arguments. Along with being the most gorgeous vertical roll of meat you’re likely to ever see in your life, the taste of the meat was beautifully charred and juicy at the same time. You can get a doner sandwich, or you can go bigger and get a plate of carved doner meat with bread on the side. Address: Sinanpaşa Mahallesi, Mumcu Bakkal Sokak, No 6, Beşiktaş, İstanbul; Open hours: 10:30 am to 6 pm daily. Kofte Sandwich Stall (grilled) – The first meal I had in this entire Istanbul travel guide was this small kofte street food stall, just behind the Ritz-Carlton Hotel and Vodafone Arena. The friendly service paired with freshly grilled kofte minced meat patties, all stuffed into bread with spices, was absolutely sensational. I’m not totally sure about address or open hours, but it sets up behind Vodafone Arena and just a short walk from The Ritz-Carlton, open for lunch for sure. Kral Kokoreç (lamb intestines) – One of the Turkish foods I was most looking forward to trying when I was in Istanbul is kokoreç, which is a number of organs wrapped with baby lamb intestines (in this case) and roasted. At Kral Kokoreç, you can order your kokoreç in a sandwich, or on a side plate with bread for the bigger option. I loved it, the organs had a slightly bitter and spicy taste, while being crispy and oily. There is also a plate of midye dolma sitting on your table when you eat at Kral Kokoreç, and they are worth digging into as well. Address: Hobyar, Büyük Postane Cd. No:50, 34112 Fatih/İstanbul; Open hours: 9 am to 9 pm daily. 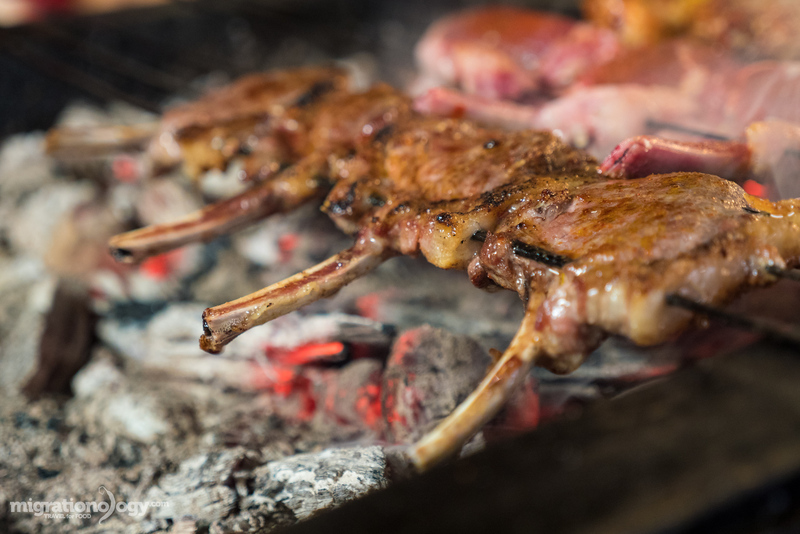 Zübeyir Ocakbaşı Restaurant (grilled meat) – When my friend David instructed me to eat at Zübeyir Ocakbaşı for life-changing kebab and grilled lamb in Istanbul, I didn’t take his recommendation lightly (I knew he would be right). First of all, an ocakbaşı is a type of indoor Turkish grill with a big metal chimney. Words cannot describe how incredibly amazing the lamb kebab was – it was soft and tender, salty and seasoned, and it literally melted on my tongue. I’m going to stop there before even getting into the lamb chops. But yes, it would be terrible to miss the lamb chops as well. Address: Şehit Muhtar Mh. Bekar Sk. No 28 Beyoğlu/İstanbul, 34435; Open hours: 12 noon to 12 midnight daily. Balkan Lokantasi (home-style food) – I had no clue what to expect when my wife and I walked over to Balkan Lokantasi for dinner one evening. The line was out the door, and I could see dozens of prepared dishes ready to be served. 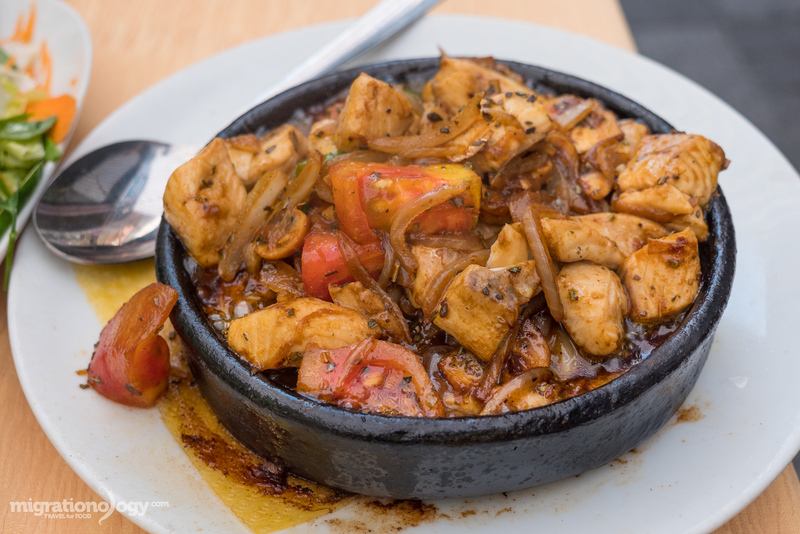 It’s cafeteria style, and there’s no way I could tell you all the names of the dishes, but you can pretty much eat any kind of home-style Turkish food – from casseroles to stews. It’s a fantastic restaurant in Istanbul to have a feast on a budget. Address: Cihannüma Mahallesi, Akmazçeşme Sokak, No 6, Beşiktaş, İstanbul; Open hours: 10 am to 9:45 pm daily. Fish and Meat House (seafood) – Located in Beyoğlu, near Istiklal Street and Taksim Square, this small family run restaurant is another good place to eat grilled fish and salad. I ordered the grilled sea bream, which was fresh, simple, and cooked perfectly so it was oily and moist. Address: Cihangir Mahallesi, Sıraselviler Caddesi, Soğancı Sokak, No 8/D, Beyoğlu, Istanbul; Open hours: 12 noon to 12 midnight daily. Balıkçı Lokantası Restaurant (seafood) – Of all the restaurants I included in this Istanbul travel guide, for the friendliness, off the beaten path location, and for their braised black sea salmon, Balıkçı Lokantası was one of my personal favorites. Along with an outstanding plate of grilled hamsi (anchovies), the stunner for me was this clay dish of black sea salmon with onions and spices, braised in what I think was olive oil and butter. I’m still dreaming about it. Address: Rıhtım Cad. Teyyareci Sami Sk. No:20/1 Rasimpaşa Kadıköy, İstanbul; Open hours: 12 noon to 9 pm daily. Fıstık Kebap Lahmacun (lahmacun) – Lahmacun is a popular Turkish food of a round of dough that’s topped in a thin meat spread and baked. Thanks to Culinary Backstreets for their recommendation to eat at Fıstık Kebap Lahmacun, a lovely restaurant in Ortaköy. The lahmacun was good, the pide (another meat filled trough bread) was excellent, and their special Fıstık Kebap plate was incredible. Address: Mecidiye Mahallesi, Büyükşekerci Sokak, No 4/A, Beşiktaş, Istanbul; Open hours: 11 am to 11 pm daily. Balık Ekmek at Eminönü (fish sandwich) – Located on Eminönü pier, one of the most famous Istanbul street food dishes to eat is balık ekmek, a sandwich of grilled mackerel. There are a series of boats where the food stalls set up grill the mackerel. You can take a seat on the pier at one of the boats, and order up a big fish sandwich for a fantastic meal or snack. 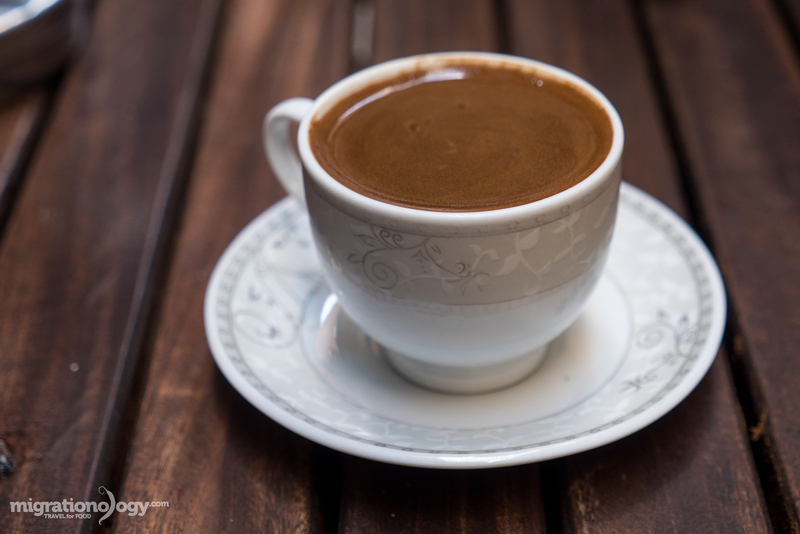 Mandabatmaz (Turkish coffee) – Ever since visiting Jordan and drinking about 8 cups of Turkish coffee per day, I’ve been a little obsessed with it. Mandabatmaz, a Turkish cafe off of Istiklal street, serves excellent Turkish coffee that’s full of chocolatey flavor and cardamom. If you’re shopping at Istiklal street, this is a cafe you want to make sure you don’t miss. Address: İstiklal Cad./olivia Geçidi 1/A, Beyoğlu/Istanbul – Europe, Turkey; Open hours: 9:30 am to 12 midnight daily. For this Turkish food section of this Istanbul travel guide I want to say a special thank you to all of you who gave me your favorite restaurant recommendations. Istanbul Food – Tuba is a friend of mine and she’s passionate about Turkish food. She also gives food tours. Culinary Backstreets – Great content about authentic local food. I also used sites like Zomato and Foursquare for food recommendations in Istanbul. 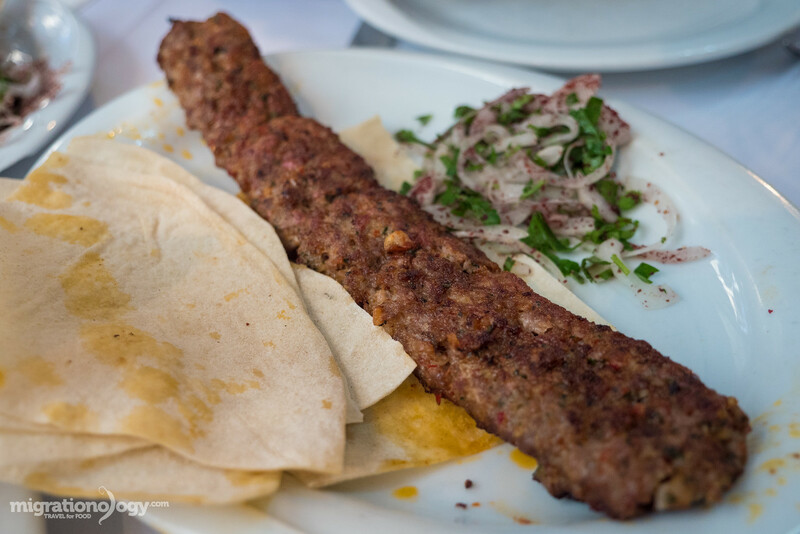 Coming soon on the blog, check out a full post about Turkish food that goes more in depth into individual dishes. From Byzantium to Constantinople to Istanbul, the city has been a center of civilization and empires for thousands of years. The history of religion, architecture, and art, are jus a few of the things that make Istanbul such an attractive city. While I did have the opportunity to visit and cover the most famous attractions in Istanbul in this Istanbul travel guide, there were a few more off the beaten path attractions that I wanted to visit, but due to circumstances, I wasn’t able to get there. But here are a few things to do in Istanbul, and as touristy as some of these places are, they are truly breathtaking to visit in person. In order to avoid waiting in lines to buy tickets, and to save a bit of money, I bought the Istanbul Museum Pass for 85 TL ($28.47) per person. The pass allows you entrance to many museums, but not all of them (see list here). For the amount of sightseeing I did and covered in this Istanbul travel guide, I’m not sure if I really saved much money by purchasing the card, but I did avoid some lines for sure. If I had had a few more days in Istanbul to visit some more museums, it would have been worth it more financially as well. So it’s up to you whether you want to purchase it or not. Hagia Sophia – Now a museum, but previously a mosque and even before that a church, Hagia Sophia is one of Istanbul’s most famous attractions and landmarks of the city. The giant structure, minarets and domes are wonderful to see from the outside, and the inside is just as spectacular. I enjoyed the upper decks for high up views of inside and the original mosaics. Visiting information: Ticket price – 40 TL; Open hours – 9 am to 7 pm from 15 April to 25 October and 9 am to 5 pm from 25 October to 15 April daily; Directions – Hagia Sophia is in Sulthanamet, you can get there by tram or on foot. 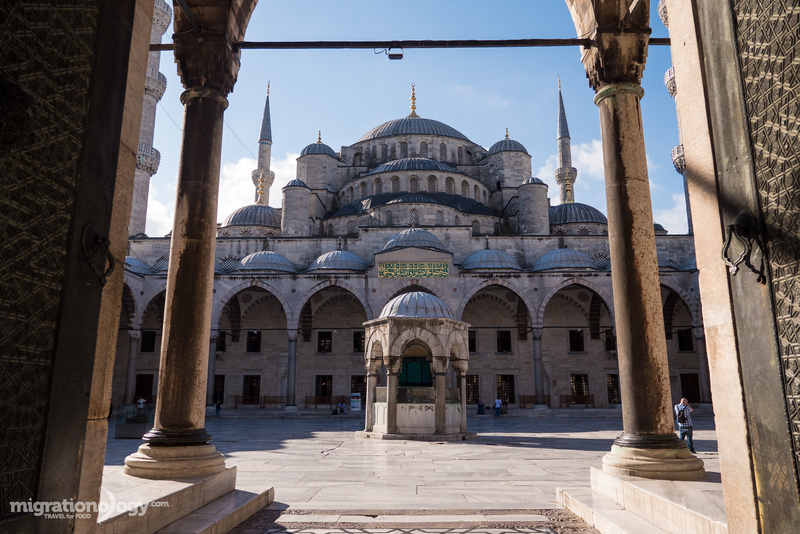 Sultan Ahmed Mosque (Blue Mosque) – Just a short walk from Hagia Sophia is Sultan Ahmed Mosque, often referred to as the blue mosque for the blue tiles used in the interior construction. The mosque was built between the years 1609 and 1616, and it includes a complex system of domes and minarets. The inside prayer hall is decorated with red carpet, ancient chandeliers, and mosaic and tile work. Visiting information: Ticket price – Free; Open hours – for non-Muslims it’s closed during the 5 daily prayers times for about 90 minutes each prayer time, it opens about 30 minutes after each prayer time in the day; Directions – Sulthanamet tram; Also make sure you dress appropriately, although they do have clothing to borrow. Topkapi Palace – Completing the trio of the most popular attractions in this Istanbul travel guide, Topkapi Palace is right in the same area. Now a UNESCO World Heritage Site, the Topkapi Palace is a former Ottoman Sultan palace full of courtyards, gardens, galleries, and one of the highlights – the Imperial Harem. Visiting information: Ticket price – 40 TL; Open hours – 9 am to 6:45 pm from April 15 to October 30 and 9 am to 4:45 pm from October 30 to April 15 (closed on all Tuesdays); Directions – Sulthanamet tram. Basilica Cistern – Again, located right in old Sulthanamet, across the street from Hagia Sophia, my wife and I decided to check out the Basilica Cistern, one of many underground cisterns in Istanbul. After paying the entrance fee, you can walk around the dark and spooky cistern filled with columns and water, and don’t miss the mysterious Medusa head statues. Visiting information: Ticket price – 20 TL ($6.80); Open hours – 9 am to 6:30 pm in summer and 9 am to 5:30 pm in winter daily; Directions – Sulthanamet tram. Süleymaniye Mosque – Similar to the Blue Mosque yet less visited by tourists, and just as iconic to Istanbul’s skyline is the impressive Süleymaniye Mosque, another Ottoman masterpiece. Along with entering into the mosque you can enjoy some amazing views of the Golden Horn and Bosphorus from the gardens. I visited Süleymaniye Mosque right before going to the Grand Bazaar as they are in the same general area. Visiting information: Ticket price – Free; Open hours – closed for Non-Muslims during the five daily prayer times (which change daily); Directions – I think the easiest way to get here is by walking from Eminönü. 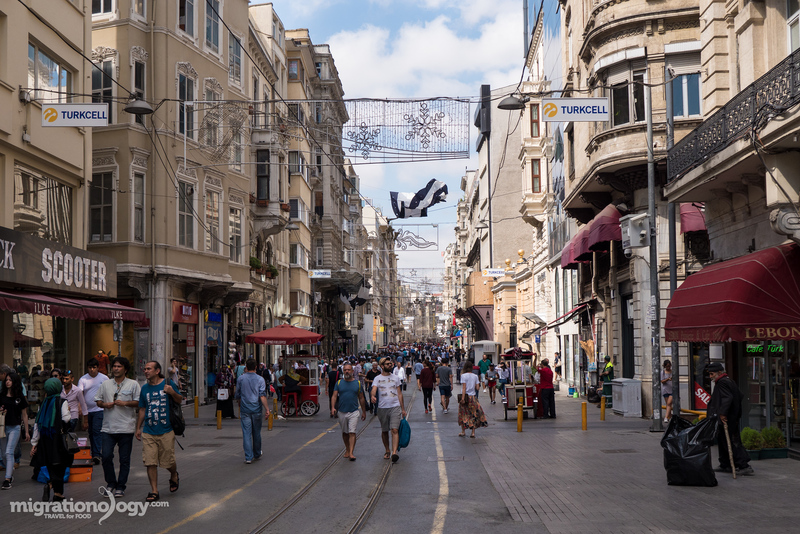 Istiklal Street and Taksim Square – A walking pedestrian shopping street, Istiklal Street is a great place to go shopping and people watching. There’s also a historic tram you can take if you please, and countless restaurants and cafes along Istiklal and on side lanes and streets. Taksim Square, a giant open space and the center of modern Istanbul is well worth checking out as well. Visiting information: Open hours – about 10 am to 7 pm or 9 pm; Directions – Metro to Taksim Square or walk there. Galata Tower – Sitting on the top of the hill in Beyoğlu, this nine storey tower remained the tallest structure in Istanbul for hundreds of years. Now it’s open as an observation tower and there’s also a restaurant and cafe. I went to the top and enjoyed some amazing 360 degree views of Istanbul. I went in the morning right as they opened and there were only about 5 of us there. Visiting information: Ticket price – 25 TL ($8.40); Open hours – 9 am to 8:30 pm daily; Directions – It’s about a 15 minute walk from Karaköy or from Istiklal Avenue. 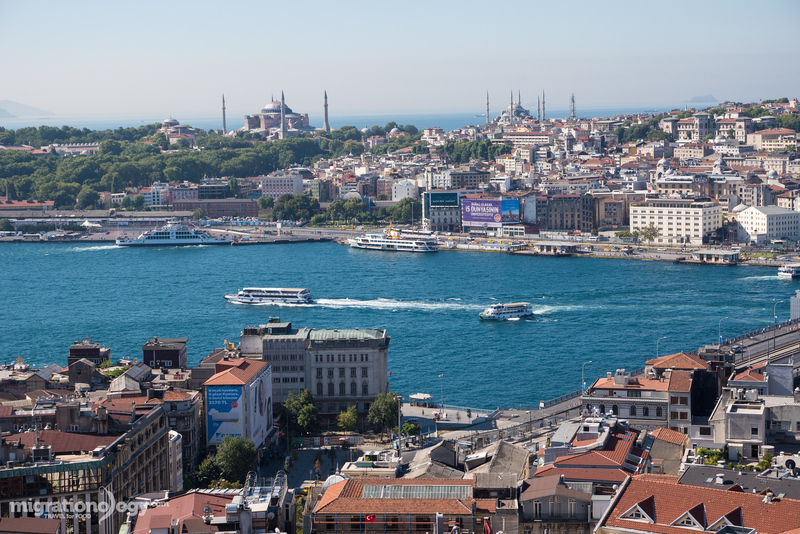 Galata Bridge – Connecting Eminönü to Karaköy (both on the European side of Istanbul), and crossing the Golden Horn (and offshoot of the Bosphorus Strait), the Galata Bridge is a joy to walk across and soak up the views. It’s also a favorite fishing spot, and you can eat a delicious balik ekmek (fish sandwich) on either side of the bridge. Do you like my photos in this Istanbul travel guide? 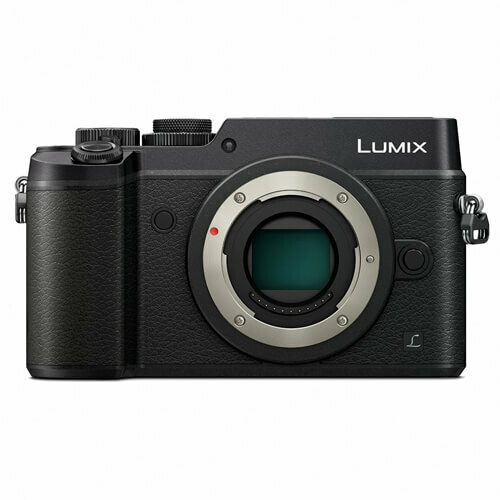 Check out the camera gear I use here. 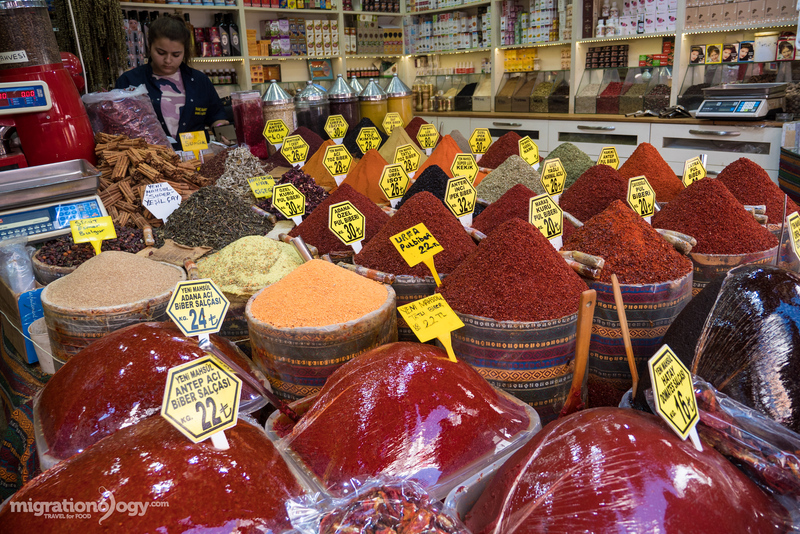 Spice Bazaar / Egyptian Bazaar – For food lovers like you and I, Istanbul’s Spice Bazaar, also known as the Egyptian Bazaar, is a place you don’t want to miss. Located in Eminönü, there’s a covered indoor section, but the outdoor section is what I really liked, packed with cone shapes of colorful spices, fruits, vegetables, dried fruit and nuts. It’s an amazing overdose of Turkish ingredients and food trade in the world. If I could choose one thing from this Istanbul travel guide to do (apart from eating) it would be to explore the spice bazaar. Visiting information: Open hours – 8 am to 7:30 pm on Monday to Friday (closed on Saturday and Sunday); Directions – Tram to Eminönü or walk. Grand Bazaar – Not only one of the oldest indoor markets in Istanbul, but one of the oldest in the world, this indoor shopping mall is not just a shopping paradise, but a museum at the same time. I’m not a big shopper, but I loved getting lost in the narrow lanes of the Grand Bazaar, checking out everything from carpets to jewelry, and especially sitting down for a cup of Turkish tea. Visiting information: Open hours – 8:30 am to 7 pm from Monday to Saturday (closed on Sunday); Directions – Tram to Eminönü or walk. Kadıköy Market – I did not have enough time to explore the Asian side of Istanbul as much as I would have liked to. But one day, we did take the boat over to Kadıköy to walk around the market. 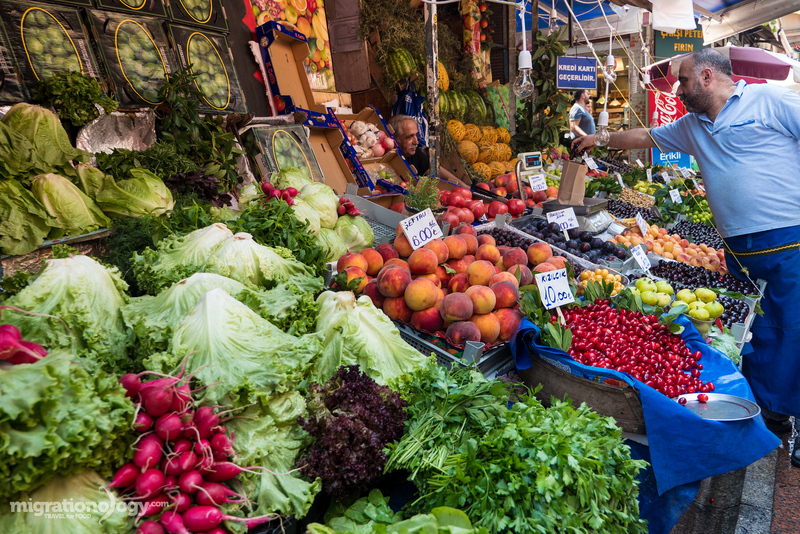 It’s a fantastic Istanbul food market to explore, I would highly recommend it. Visiting information: Open hours – about 9 am to 7 pm (closed on Sunday); Directions – Ferry to Kadıköy. These are some of the most famous things to do in Istanbul, but there are many many other things to do as well. I did enjoy these historical sites, but most of all, I just enjoyed being in Istanbul, while experiencing the local food and culture. There are many different modes of public transportation in Istanbul, most of which work very smoothly and hassle free. However, if you enjoy walking, Istanbul is a fantastic city to explore on foot. When researching the restaurants and attractions in this Istanbul travel guide, my wife and I walked all around Taksim, Beyoğlu, Sulthanamet, and even Beşiktaş on foot. Tram – Not extremely extensive, but useful if you’re in the right place, is the Istanbul tram. I took it a few times from Kabataş to Sulthanamet, and it was easy and fast. You can buy single tickets, or 3 rides at a time for 10 TL ($3.40). Bus – Public buses in Istanbul are a major form of public transportation in Istanbul. I will admit I don’t have much experience with the bus, but I did take it a couple times up and down main roads. You can usually see the destination where the bus is en-route to, of if you have internet on your phone, you can look up bus routes on Google Maps. The bus rides I took cost 2.5 TL ($0.84) per person. Taxi – Yellow Istanbul taxis are prevalent, not hard to wave down, and just like many other major cities, there are occasionally reports of drivers ripping off customers. However, overall, taxi drivers are friendly and very convenient to use. Same tips go for all over the world – don’t catch a taxi in front of a famous tourist attraction, know the route you want to go, make sure the driver uses the meter. Here are some more tips. You’ll pay 10 – 20 TL ($3.34 – $6.69) for a short ride and 20 – 80 TL ($6.69 – $26.76) for a longer ride. See more details here. Uber – If you sign up using this link, you’ll get a free ride. Since I had portable internet in Istanbul, my wife and I used Uber quite a few times in Istanbul. It’s convenient, good price, the cars we got were often Mercedes vans, and I had great experiences with Uber in Istanbul. A ride from the Grand Bazaar to my hotel at Taksim Square cost 31 TL ($10.36). 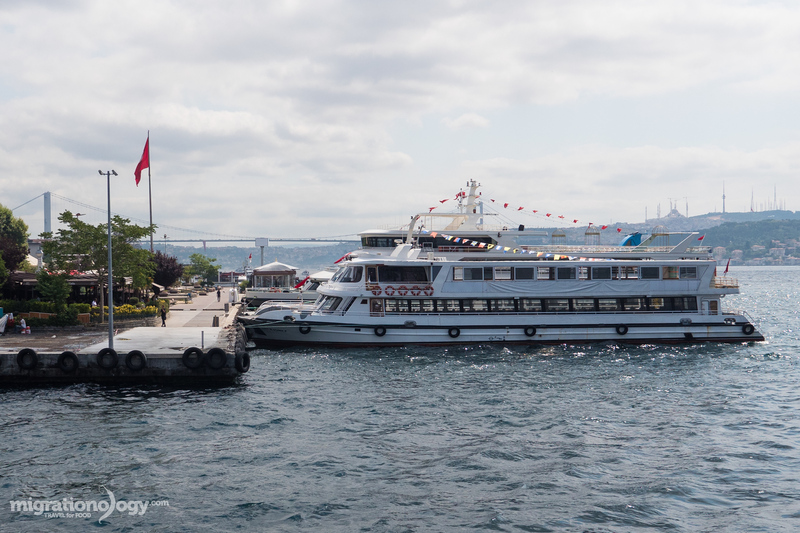 Boats – Ferry boats across the Bosphorus are one of the main types of transportation. I didn’t fully figure out the boat system as I only took it a few times, but you basically just go to the pier, and take the next boat to the pier you’re going to (do check routes and time schedules on the website). You’ll get some awesome views taking the ferry in Istanbul. Is it safe to travel to Istanbul? In most of my city travel guides I don’t typically address safety. However, Istanbul and Turkey being at the forefront of world news recently, I just thought I would share my opinion about, “is it safe to travel to Istanbul?” – I get this question a lot for Bangkok as well, and many of the principles are the same. Anything could happen anywhere – The first thing I think about when it comes to safety and traveling is that anything could happen anywhere in the world. And no safety advisor in the world can predict anything. Media is often blown out of proportion – Media often covers bad situations, and makes them feel like the entire country is a war zone; When in reality, life in the city and neighborhoods often continues. Media is something to be aware of, but not to base your full judgment on. Fear is real – There’s no doubt about it, fear is real, and it causes you and I to never do some things we want to do. For me, realizing that anything could happen anywhere, gives me comfort and inspiration to overcome the fear and go for it. On this particular trip to Istanbul, my wife and I were there during the attempted coup. When we first read the news, we were scared. But unless you happened to be in the really wrong place at the really wrong time (which we do have to acknowledge is a possibility – that goes for anywhere we are), there wasn’t a real danger to tourists or civilians. We remained safe throughout the attempted coup, and the day after the coup turned out to be one of my favorite food days of our entire trip to Istanbul. 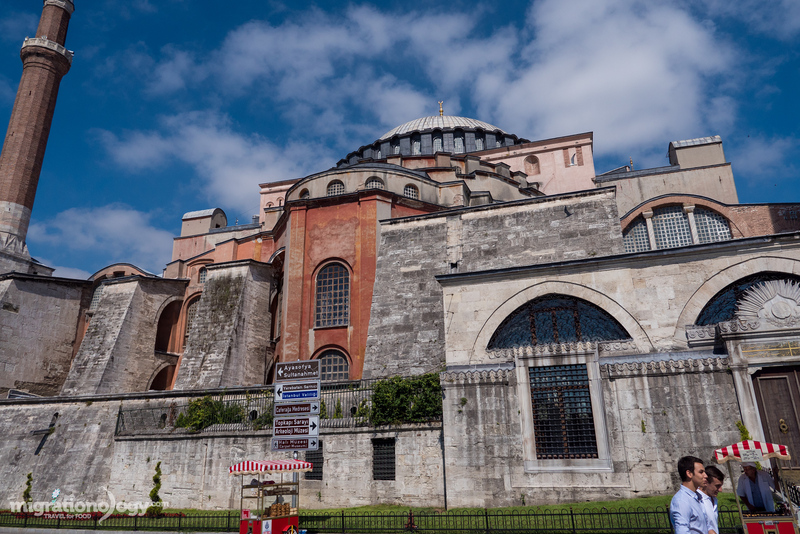 Visited attractions off-peak time – Partly to avoid crowds, and partly for safety, my wife and I tried to go to some of the famous attractions in Istanbul early in the morning, or before the main crowds arrived. Going out at night – My wife and I aren’t really into nightlife in the first place (we are in bed by 10 pm usually), but avoiding nightlife is a way to greatly reduce the risk of something bad happening. Being alert and using common sense – Accidents and unpredictable events happen, but being alert and using common sense can be of some help. Final Thought: I’m not an expert on travel safety, and I don’t think there’s ever a certain answer for, “is it safe to travel to Istanbul?”, but I hope this provides a bit of insight. What I can say for certain is that in my experience, the overwhelming majority of people in Istanbul are friendly, hospitable, and willing to help you in any way they can. 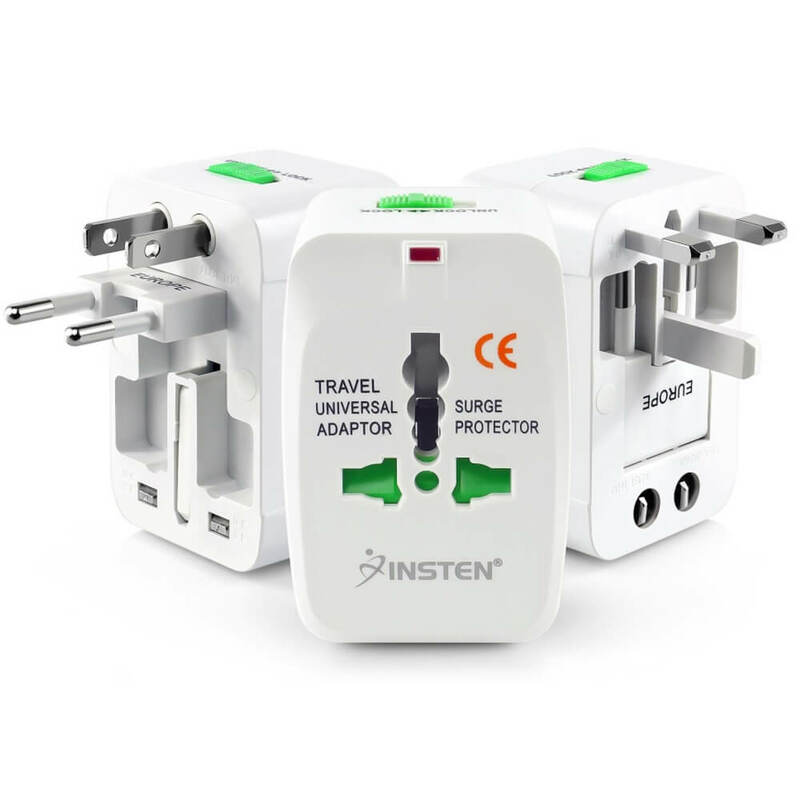 During my trip to Istanbul I bought a TEP wireless internet device that I used everyday with unlimited internet access. It was a huge help for looking up information and doing research on where to go and what to eat for this Istanbul travel guide. You can rent one for $9.95 per day. For mobile phone, Turkcell, Vodafone, and Avea are all popular. If you want to buy a SIM, the easiest way is to get it when you land at Istanbul Atatürk Airport, go to one of the mobile carriers, register yourself with you passport, and then get your SIM card and 3G plan. How much does it cost to travel in Istanbul? In comparison to cities in Southeast Asia, Istanbul is a little more expensive, but in comparison to cities in Europe, Istanbul is pretty cheap. So traveling expenses in Istanbul are somewhere in the middle of the road. But like all major cities in the world, budget is quite a lot about the choices you make. Taxi ride: About 10 – 20 TL ($3.34 – $6.69) for a short ride and 20 – 80 TL ($6.69 – $26.76) for a longer ride. Uber: Similar prices to a regular taxi. Overall, Istanbul provides very good value for money. You can stay in a nice hotel for a relatively budget price, and if you eat at local restaurants you can feast on extremely delicious food for good deals. I’ve included all the restaurants and attractions listed in this travel guide within a map. All the attractions and food you’ve read about in this Istanbul travel guide is covered in a series of travel videos from my round the world trip for food, Istanbul section. The videos and this guide really go together, the videos showing more of the experience and reality, while this guide provides written down details and info for visiting. I’d encourage you to watching the full series. Istanbul is one of those cities that no matter how high your expectations are, it will impress you beyond what you had imagined. It’s a city that when you’re there, it’s easy to become fully consumed in the breathtaking historical sites, the friendliness of the people and culture, and the abundance of incredibly delicious Turkish food. I hope this Istanbul travel guide for food lovers will give you some helpful information on where to stay, things you want to do, and Istanbul food you don’t want to miss. Have you been to Istanbul? Would you like to go? Leave me a comment below.